Israeli criticism of Kerry's peace efforts "distort his records and distract from key issues," says State Dept. spokeswoman. The State Department once again took Israel to task on Wednesday for criticizing Secretary of State John Kerry’s efforts to achieve peace. State Department spokeswoman Jen Psaki told reporters that criticism of Kerry over his threats of a boycott of Israel if peace talks fail were meant to distract attention from progress in the peace process. “Any rhetoric that is inaccurate and critical as this is unhelpful. These kind of attacks are unacceptable. They not only distort his record but they distract from the key issues at hand,” she said. Psaki added, however, that Kerry was planning to ignore the criticism and continue his efforts. “Peace isn’t a favor we’re doing for the Israelis and Palestinians, it’s something that the Israeli people and the Palestinian people want,” she continued. Psaki also commented on the series of videos that have been prepared by nationalist activists who are opposed to Kerry’s pressure on Israel to concede lands in order to achieve peace. The videos, entitled “John Kerry Solutions”, feature a salesman modeled on Kerry who is hell-bent on offering his customers solutions that only make their problems worse. Psaki’s comments from Wednesday are not the first time she has rejected Israeli criticism of Kerry, but were the harshest ones she has made. 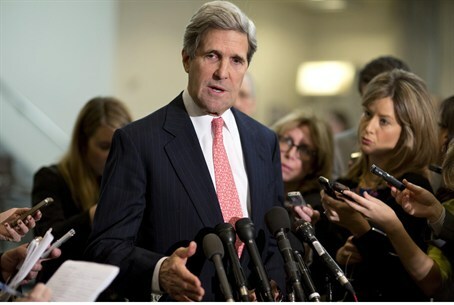 On Monday, Psaki told reporters that Kerry was “frustrated” by suggestions that he’s anti-Israel. She was followed by National Security Adviser Susan Rice, who blasted Israel over its criticism of Kerry’s boycott threats.